Welcome to the June 2015 issue of our occasional newsletters. We confess that we have been neglecting our website and blog. After living in our ramshackle house for a decade and a half, we decided to embark on renovation and redecoration, an extremely disruptive process. Thankfully, the worst is over. As we have said in previous newsletters, history has not organised itself very well for 2015, with its surfeit of anniversaries. Amongst them will be the 100th anniversary of the first successful transatlantic wireless telephone call, which took place during World War One – in October 1915 – between the wireless towers at Arlington, Virginia, and the Eiffel Tower in Paris. In 1932, the London writer and journalist Albert Gravely Linney commented that ‘the abodes of the wealthy’ in Chelsea had ‘electric lights, frigidaires, radio gramophones, vacuum cleaners, telephones, and all the modern adjuncts of our involved civilisation!’ Electrical telegraphs (literally, ‘far-off writing’) had existed from the 1830s, transmitting written messages across wires via an electrical current. Morse code (invented in the United States) became the standard method of telegraphy,while underwater cables allowed messages to be transmitted to other continents. The first ‘speaking telegraph’ or electrical telephone was patented in 1876, and by 1915 the United States had more telephones per household than any other country. In Britain, though, most people would not have a telephone for decades to come. The Eiffel Tower was originally designed and built between 1887 and 1889 as part of the Paris International Exposition (Exposition Universelle) of 1889. It was the work of three engineers – Maurice Koechlin (also involved in building the Statue of Liberty in New York), Emile Nouguier (a successful bridge engineer) and Stephen Sauvestre (head of the architectural division of the Eiffel Company). The Eiffel Company was headed by Alexandre Gustave Eiffel, whose name was linked to the tower from the outset. Both Eiffel and Lockroy published replies to these criticisms, and nothing stopped the construction of the Eiffel Tower. 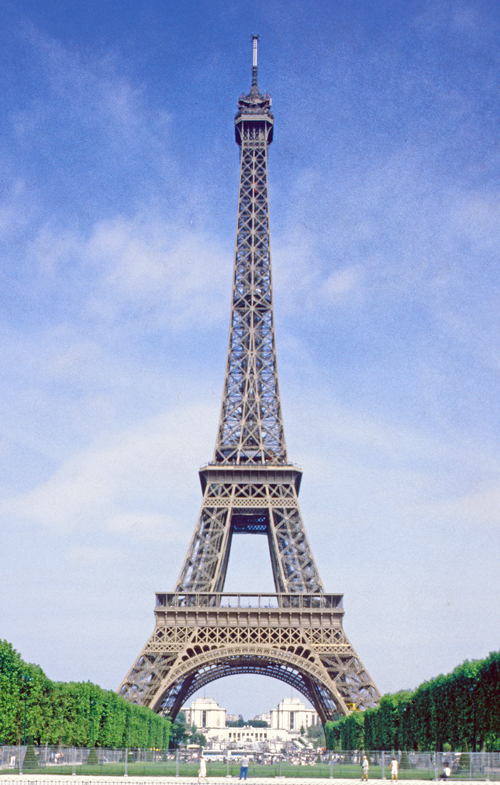 At a height of 324 metres (1,063 feet), it became the tallest structure in Paris. 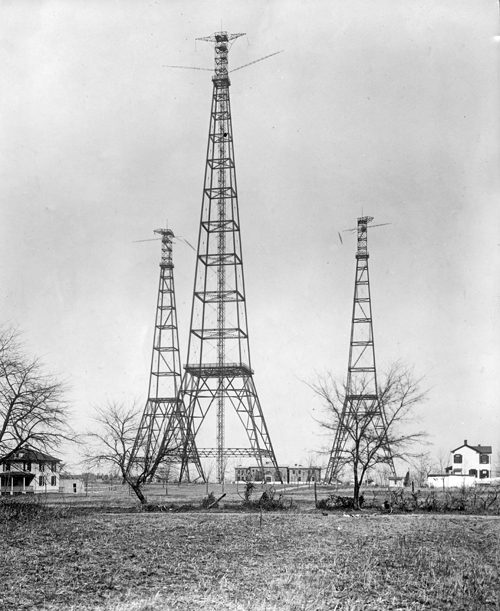 From 1898 it became involved with radio transmissions, a function that initially saved it from demolition, having been originally designed to last for only 20 years. The Arlington towers were dismantled in 1941 as they were a hazard to aviation. Today, a century after the landmark experiment, communications across the Atlantic are commonplace, using in particular the internet and satellites. The Eiffel Tower even has its own website and attracts 6–7 million visitors each year. Ultimately, it was Alexandre Gustave Eiffel who was proved right in his assertion that the tower would not be acclaimed for its artistic merit, but as an outstanding feat of engineering. The expression ‘Sweet F.A.’ has been used since late Victorian times, though the meaning has altered over the years. 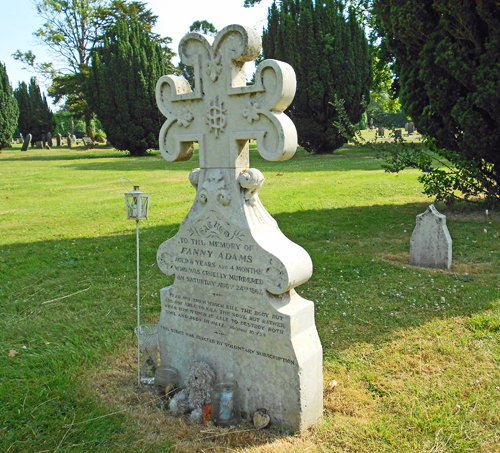 It originated in the brutal murder of Fanny Adams by Frederick Baker in 1867 in the normally quiet town of Alton in Hampshire. A few decades earlier, Jane Austen wrote some of her best-loved novels in the nearby village of Chawton, and she frequently walked to and from Alton to do shopping. In the early afternoon of Saturday 24th August 1867, 8-year-old Fanny Adams was with her friend Minnie Warner and her sister Elizabeth Adams, who was a year younger. The three girls, according to the Hampshire Chronicle newspaper, were ‘of respectable parents, residing in Tan House-lane, Alton, [and] were playing in Flood Meadow, at the back of Mr. Jefferie’s tan yard, distance from their residences about 400 yards’. At the inquest and subsequent trial, many witnesses gave sometimes contradictory statements. What seems to have happened is that Frederick Baker went up to the girls and gave Minnie some coins to take Elizabeth away. At the same time he offered Fanny ‘a halfpenny to go with him up a hollow, or old road, leading to the village of Shalden, by the side of a hop-garden’. Fanny became upset and refused, but Baker ‘laid hold of her hand and took her away crying’. Baker was a solicitor’s clerk in Alton, working for the firm of Messrs Clement & Son (one son had been the Trafalgar hero Benjamin Clement, who lived in Chawton, knew Jane Austen and died in 1835 – see our blog post here and Roy’s Trafalgar book, p. 188). Because Baker held a respectable position and because he spoke quietly to both women, they ‘went home under the impression that [Fanny] was playing about some of the neighbouring fields, and would return before long’. All evidence pointed towards Frederick Baker being guilty, and he was arrested at the solicitor’s office. Some of his clothing was damp or wet and the cuffs of his shirt had been recently washed, though they still had spots of blood. A partially hidden diary was discovered with the entry: ‘Killed a young girl. It was fine and hot.’ Baker admitted the crime, but claimed he had not meant to do it but had been intoxicated. At his trial, his defence was one of insanity, but the jury ignored his plea and found him guilty of murder. Such was the notoriety of the case that it received extensive coverage in local and national newspapers. A crowd of several thousand people attended his execution by hanging outside Winchester gaol on Christmas Eve 1867, and an effigy of Frederick Baker was added to the Chamber of Horrors at Madame Tussaud’s waxworks exhibition in London. Men serving in the military forces have always used derogatory names and black humour for the food supplied to them, including ‘salt horse’ or ‘salt junk’ for the salt beef or pork that the Royal Navy provided – ‘junk’ was a term for worn-out lengths of old rope (see our book Jack Tar). By the time of the murder of Fanny Adams, canned mutton and beef were being imported from Australia, and the seamen joked that the dubious-looking contents might be the remains of the murdered girl Fanny Adams and adopted her name as slang for canned meat. One rumour even spread that a button had been found in one can. A few years later, in 1874, another sensational murder took place, in Whitechapel, London, this time of Harriet Lane, whose decomposing body was dug up the following year, cut into pieces and wrapped up for disposal. Her murderer (Henry Wainwright) was caught trying to dispose of the packages, and the horror that this crime caused meant that her name was also used for cans of chopped-up meat. All too often naval slang passed into everyday usage, and ‘Sweet Fanny Adams’ or ‘Sweet F.A.’ became a widely used expression, meaning ‘something useless’, ‘worse than useless’ or ‘nothing at all’. There was a constant search for a successful method of preserving food for those who did not have easy access to fresh supplies, such as on long sea voyages when the diet for most seamen was hard biscuit and salted meat (pork and beef) kept in wooden casks. By the end of the 18th century a method of preserving food in airtight glass bottles had been perfected by the Frenchman Nicolas Appert, and ‘bottling’ fruit is still popular for preserving home-grown produce. Glass was fragile and heavily taxed, and so the search went on for better methods. 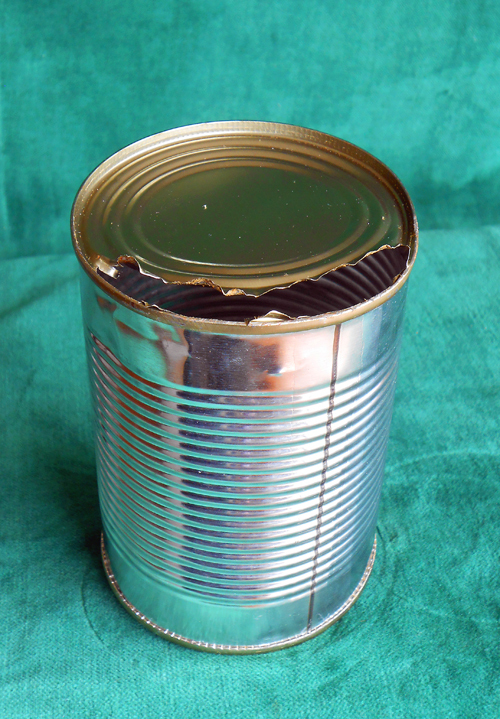 In the early 19th century, canning was developed as a means of preserving food, but it only became cost-effective after the Napoleonic Wars, using thick tin-plated iron canisters, referred to now as tins or cans – the tinning prevented corrosion (nowadays, cans and canned food tend to be called tins and tinned food in Britain). These were bulk containers, not intended for household use. By the 1840s, the Royal Navy was ever more reliant on canned meat, and the size of cans increased to around 10 pounds in weight. At the end of 1851 the Admiralty ordered supplies at the Gosport victualling yard to be examined, since it was suspected that the contractor (Stefan Goldner) was supplying sub-standard food. A truly shocking picture emerged. On 3rd January 1852, The Times revealed that 2,707 canisters (of the 10-lb size) had so far been opened, of which only 197 were edible. The problem with such large cans was that heat could not penetrate to the centre and so the meat went bad. Most of the cans were found not only to contain decaying meat, but also detritus that was not fit for human food. Much of it originated in Goldner’s canning factory in what is now eastern Romania. ‘The few cannisters containing meat fit for human beings to eat,’ The Times related, ‘have been distributed … to the deserving poor of the neighbourhood, and those containing the putrid stock have been conveyed to Spithead in lighters and thrown overboard.’ This was a huge food scandal, and seamen were highly suspicious of canned meat. From the mid-1860s vast quantities of canned mutton and beef were imported from Australia, as it was far cheaper than what could be produced in Britain, where livestock farmers were struggling to meet demand because of outbreaks of various animal diseases such as foot and mouth, bovine pleuro-pneumonia and rinderpest. The early cans were so substantial that they had to be opened with a hammer and chisel, and even knives and bayonets were used. Once the market expanded, with smaller and thinner cans, attention turned to the mechanics of opening them at home. In the 1850s, tools designed as can openers were patented in the United States and Britain. The first ones were not much better than short blades on handles that hacked open the cans, but in the 1860s a slightly better opener (the ‘bull’s head’) became popular and continued to be made into the 1930s. It was designed as a stylised bull, with the head holding the blade while the ‘body’ and tail formed the handle. The blade was of steel and the head and handle of cast iron, making it heavy for its size. 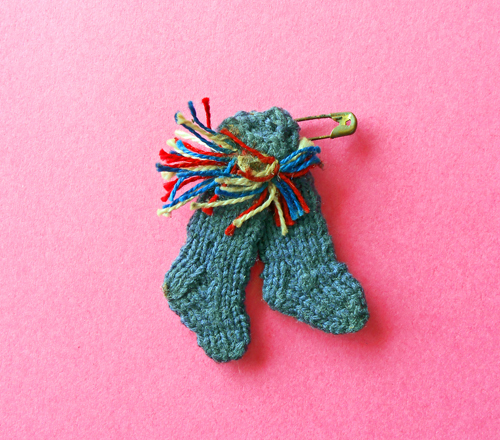 The one pictured here weighs 220 grams (nearly ½ lb) and is 15 centimetres (6 inches) long. 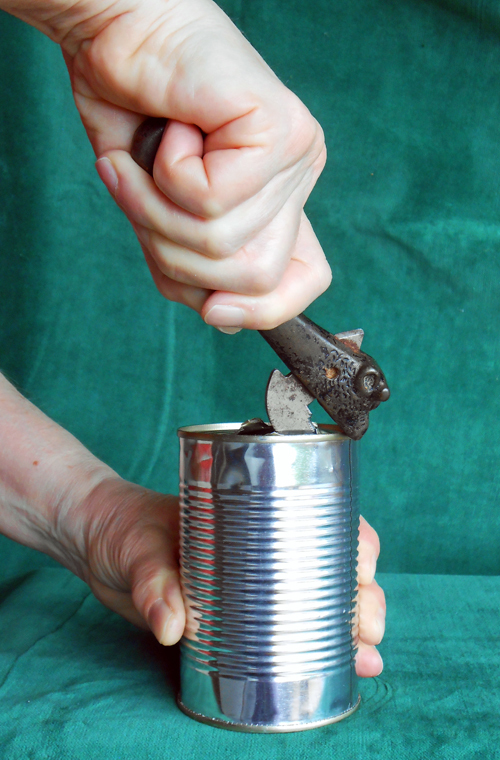 Although better than hacking a can open with a hammer and chisel, early can openers were not particularly safe. The bull’s head can opener had a short spike on the back of the head, so as to create a hole close to the edge of the top (‘lid’) of the can. This was done either with a strong, accurate blow, or else by hammering the spike into the can. 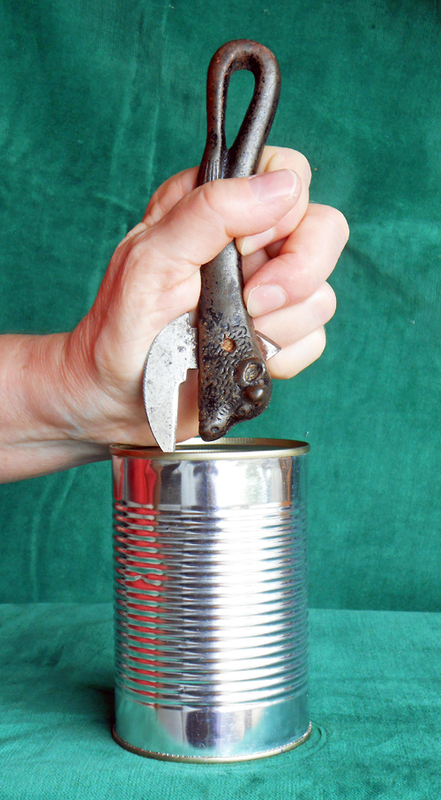 Many users dispensed with the spike and instead forced the cutting blade into the can, usually by hitting the end of the handle, a manoeuvre that was less painful with wooden-handled can openers. However, it was essential to hold the can firm by pressing it down on a flat surface with the heel of the hand, as in the first picture. Otherwise the can tended to tip sideways and the blade slipped, with the risk of an injury. Once the can was pierced, the ‘nose’ of the bull was used as a fulcrum against which to lever the blade upwards again and again (as in the next picture), ripping open the lid until it could be folded back. Care was needed in removing the food, as the cutting technique produced lethal, ragged metal edges (as in the third picture). 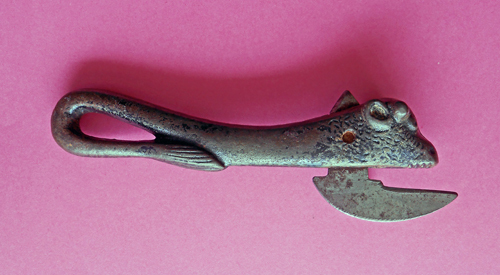 After the very robust and heavy design of the bull’s head can opener, later can openers were lighter and easier to use (often with a wooden handle) although they still followed the same basic pattern and method of use. The introduction of rotary can openers meant that the tops of cans could be removed more neatly and safely, and electric can openers were developed in the 1950s from the rotary designs. Ring-pulls or levers built into the lids now mean that can openers are increasingly redundant. A few weeks ago, on 8th May 2015, Britain commemorated the 70th anniversary of VE Day (Victory in Europe Day). This was not the end of World War Two, which continued in the Pacific, but the end of hostilities in Europe. In World War One, Britain had experienced a few raids by air and sea, but in World War Two the conflict was brought right into the British Isles with the bombing, the shortages caused by the war at sea disrupting supplies, and the constant threat of spies, raids and invasion. VE Day was therefore particularly significant for everyone. Very few people in Britain had an easy life during World War Two, but it could be particularly gruelling for those in the munitions factories, as one young woman found. Ivy Clarke was a teenager who had not long left school when the war broke out. She took a job at a munitions factory in Maidenhead, working on machine lathes that cut and shaped metal castings, eventually being promoted to supervisor in charge of four machines. It was work that she came to enjoy, but it was hard, with shifts of 12 hours at a time, 7 days a week, with one month of night shifts, then a month on days. The only time off was at the changeover from nights to days (or back again), when the shift workers had a weekend to themselves. Ivy was also part of the Local Defence Volunteers, better known by the initials LDV – which cynics said was an abbreviation of ‘Look, Duck and Vanish’. She was given training in fire-fighting and had a specific area to patrol when the air-raid siren sounded. 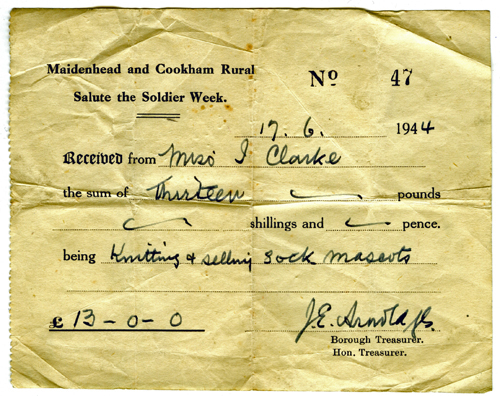 Ivy Clarke’s experiences during World War Two is just one person’s part of the hard work and hardship that the people on the ‘Home Front’ in Britain had to endure, so it is not surprising that when peace in Europe finally came on 8th May 1945, there were widespread celebrations. Mindful that the war with Japan was not over, Winston Churchill may have cautiously said ‘We can allow ourselves a brief period of rejoicing’, but everything had changed for the people in the streets. They were looking forward to an end to war work, an end to rationing and the prospect of their loved ones returning home. With Austerity following on from the war and with rationing set to continue for nearly a decade, until 1954, the brighter future everyone looked forward to in May 1945 was actually a very long time coming. The year 2014 saw the 200th anniversary of the ending of the long wars with Napoleon. Like VE Day in 1945, the celebrations in 1814 were especially joyful after more than a decade of war. 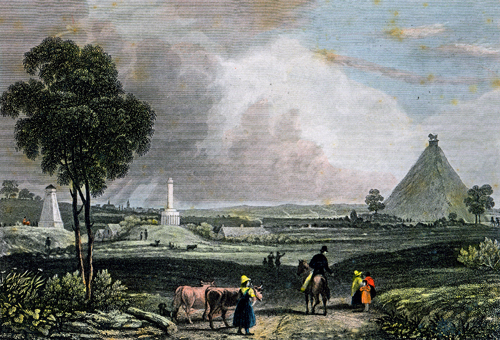 As we mentioned in our newsletter for Newsletter 39 (under ‘The Start of the Hundred Days’), Napoleon escaped from exile and returned to France in early 1815, only to be defeated once and for all at the Battle of Waterloo in Belgium in June 1815, giving us yet another 200th anniversary. In our book Eavesdropping on Jane Austen’s England, we include descriptions of the state of people’s teeth, as well as dental hygiene and treatment. It was common for all ranks to lose their teeth at an early age, particularly as sugar was so popular, but the wealthy could afford to purchase dentures. These were crafted from human teeth set on an ivory or animal bone base. The teeth came from corpses, quite often removed by graverobbers. Alas, we will never know what was planned for this crescent, because Jane Austen died in 1817 before completing the novel. Being fond of the Royal Navy and her two naval brothers Frank and Charles, Jane would most likely have preferred the name ‘Trafalgar’, and we have the feeling that for people today, the allure of the sea and the Age of Sail will ensure that Trafalgar always wins the popularity stakes. We keep talking about the number of anniversaries in 2015, so perhaps we can squeeze in one more. The 210th anniversary of Trafalgar will fall on 21st October 2015, highlighting that it took a decade after this famous sea battle for Napoleon to be defeated on land at Waterloo. In September 2001, we were travelling through Spain, a trip that we remember vividly because of the terrible events in New York on the 11th, which we barely understood as it was difficult to get hold of news. A few days later, we reached Gibraltar and visited the Trafalgar cemetery. We were then anxious for the holiday to finish, as we wanted to find out what books were available on Trafalgar and if it was a viable subject for us to tackle for our next book. As it happened, we both embarked on different projects, and it was Roy who wrote the Trafalgar book. Since then, we have resumed writing our books as joint authors. Like all our books, it was not written for a specialist reader who wanted a blow-by-blow account of every single ship’s manoeuvres. Instead, it deals with the build-up to Trafalgar, the battle itself, the subsequent hurricane and the aftermath of the war, with an emphasis on the experiences of the men, women and children. As this poor wasted form will plainly shew. The soldiers of Waterloo fared no better, and yet anyone researching their family history today finds it quite a thrill to find that they have Trafalgar and Waterloo ancestors. The book is available as a paperback published by Abacus, called Trafalgar: The Biography of a Battle. 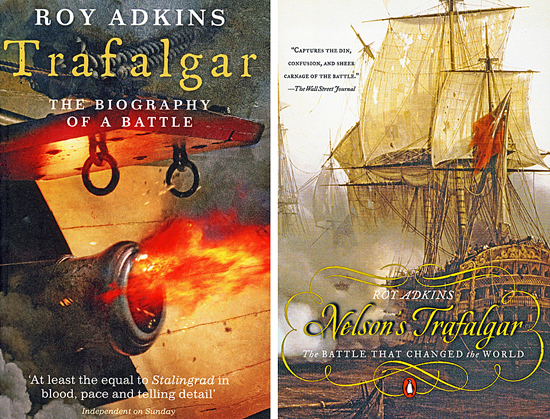 In the United States, it is published by Penguin and is called Nelson’s Trafalgar. Both publishers have also produced e-books.